What's next for the thousands whose unemployment benefits are set to expire? 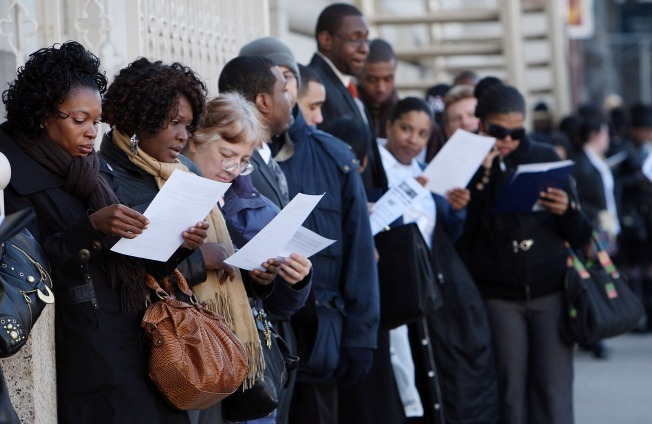 More people will be headed to the unemployment and job fair lines. WASHINGTON — In the coming weeks and months, hundreds of thousands of jobless Americans will exhaust their unemployment benefits, just when it's never been harder to find a job. Congress extended unemployment aid twice last year, allowing people to draw a total of up to 59 weeks of benefits. Now, as the recession drags on, a rolling wave of people who were laid off early last year will lose them. Precise figures are hard to determine, but Wayne Vroman, an economist at the Urban Institute, estimates that up to 700,000 people could exhaust their extended benefits by the second half of this year. Some will find new jobs, but prospects will be grim: Layoffs are projected to go on, and many economists expect the jobless rate, already at 8.5 percent, to hit 10 percent by year's end. "It's going to be a monstrous problem," Vroman said. U.S. employers shed 663,000 jobs in March, and the jobless rate now stands at its highest in a quarter-century. Since the recession began in December 2007, a net total of 5.1 million jobs have disappeared. Those who know that their unemployment aid is about to run out are counting the days, taking on odd jobs, moving in with relatives and fretting about the future. "My biggest fear is we'll lose the house," said Hernan Alvarez, 54, an Orlando, Fla., construction worker who lost his job in July and whose benefits will end in four weeks. "The only thing I can do is keep looking for work and hope tomorrow will be better than today." That so many people have remained on jobless aid for more than a year underscores the depth and duration of the recession, which began in December 2007. If the downturn extends into May, it will be the longest recession since the Great Depression. The jobs crisis it has created has proved worse than most economists forecast — not to mention what lawmakers expected when they extended jobless benefits last year. In March, nearly a quarter of the unemployed had been without work for six months or more, the highest proportion since the 1981-82 recession. And the problem will probably get even worse. Employers typically remain reluctant to hire even months after a recession has officially ended. In the 1990-91 and 2001 recessions, the jobless rate peaked more than a year after the recovery began. "What comes next, I'm afraid, will be the mother of all jobless recoveries," said Bernard Baumohl, chief global economist at the Economic Outlook Group, a consulting firm. "While we may emerge from recession from a statistical standpoint later this year, most Americans will be hard-pressed to tell the difference between a recession and a recovery the next 12 months." That's grim news for Sterling Long, 40, of Pittsburgh, who said he's willing to take any job available to support his wife and four children. He has cleaned houses and done other odd jobs since being laid off from a plumbing distributor in March 2008. He is dreading the expiration of his benefits this month. "I'll work in McDonald's," he said. "I got no pride as long as the people in this house eat, have hot water — that's all I need." Long, like many of the long-term unemployed, has tried to learn new skills. For three months, he spent Saturdays and Sundays working to get his commercial driver's license. That led to work as a cargo loader for a couple of months at the supermarket warehouse. But since then, nothing. States typically provide 26 weeks of unemployment benefits, an average of about $350 a week. Last year, Congress tacked on 20 extra weeks of benefits, and later it added 13 additional weeks for people in states hardest-hit by unemployment. Experts said food stamps and other social programs provide a partial backstop for many recipients who exhaust benefits. Some will also take low-paying "tideover" jobs — if they can find them, said Rebecca Blank, an economist at the Brookings Institution. One of them is Rainie Uselton, 39, who also lives in Pittsburgh. She took a course to become a certified nursing assistant after being laid off from a restaurant early last year. She landed a job at an assisted-living facility but lost it after her car broke down and she couldn't make it to work. Uselton is caring for a friend's mother part-time in exchange for a meal, bus pass and $50 a week. She hopes to use that money to help pay for car repairs before her benefits run out in four weeks. "It takes a little longer to fall asleep because of all the scenarios in your head," Uselton said. Unemployment has risen so high that in some states a third leg of benefits is kicking in — a new lifeline for many who would otherwise run out. Under federal law, states found to have particularly high unemployment under complex formulas must provide 13 to 20 more weeks of benefits. It has already taken effect in 18 states, twice as many as activated it in either of the last two recessions. The National Employment Law Project, an advocacy group for low-wage workers, wants more states to change their laws to make it easier for the extended benefits to kick in. The federal stimulus package provides full federal funding for the extension, which otherwise would be split between the states and federal government. California's Legislature took such a step last week, and Gov. Arnold Schwarzenegger is expected to sign the legislation. That comes as a huge relief to Beth Lambert, 58, of San Diego, who's been out of work since January 2008 after losing her job as an administrator at a construction company. "I can breathe for a few more weeks and just keep trying," she said.